STAY TUNED FOR UPDATES ABOUT THE FABULOUS TUNES IN THE DUNES STAFF OF 2019. The Quiet American is husband and wife duo, Aaron and Nicole Keim. At their home in Hood River, Oregon they live an artistic life, making music, building musical instruments, writing books, crafting folk art and raising their 4 year old son, Henry. 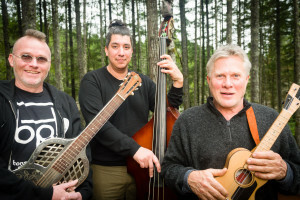 Their connection to folk tradition is undeniable, even as they find new ways to sing old songs and unique ways to incorporate music and art into their teaching and performing. Mainly influenced by Depression era string band music and the folk revival, they play ukulele, banjo and accordion to accompany their harmony singing, pick old tunes and lead the audience through group singing. Aaron builds musical instruments at Beansprout Musical Instruments. Nicole’s art is at Marmalade Creations. Steven Espaniola uses his incredible voice to honor Hawaiian traditions while creating new music of his own. Ukulele, Upright Bass, and Leo Ki’e Ki’e (Traditional Hawaiian falsetto singing). 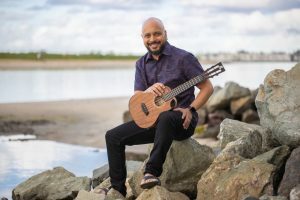 Of Hawaiian, Filipino and Spanish decent, his ethnicity is as diverse as his unique sound which preserves the integrity of the traditional with a flourish of the modern while encouraging people of all ages to connect through music. Casey performs music that swings! He plays boogie-woogie, swing, and stride piano, blows lyrical cornet, but his most unique instrumental voice is a 6-string tenor ukulele. He grew up in Southern California and has followed his musical passion for well over 40 years. He and his bands have toured in Australia, and Japan and played swing camps in England, France, Italy, Spain, Sweden, Thailand and South Korea. 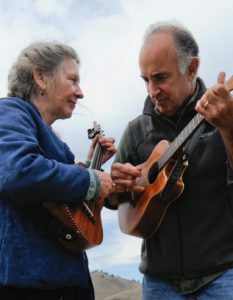 Folksingers, songwriters, multi-instrumentalists and raconteurs, Kate Power and Steve Einhorn have been dubbed a folkstitution in the northwest for their contribution to the Portland folk music scene since the 1970s. Pete Seeger called their harmonies ‘wonderful!’ and they have worked with Tom Paxton and a long line of folk luminaries over the years, played as featured guests on A Prairie Home Companion, produced countless community events to raise social awareness and funds for neighbors in need, and fueled the uke craze as hosts to the first Uke Convergence at Artichoke Music in Portland in 2000 up to the present day. Together with the creation of their whimsical Ukalaliens Songbook (illustrated by Steve) and dozens of Kala ukes-to-share, they have traveled with a long-term mission to convert small groups of the uninitiated to the joys of singing songs and making music from scratch on the ukulele. 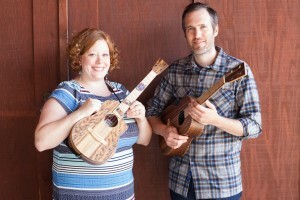 Kate & Steve may be heard in concert, in duo, and as founding members of the urban folk super-group, The Portlanders, and on various recordings available at CD Baby, including the latest Portland Romance and Rosa Lucy. Learn more at: qualityfolkdojo.com. Andy Andrews channels his ukulele passions and skills to guide us in experiencing joyful music together. 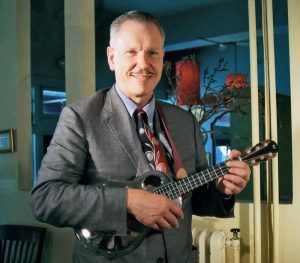 Andy Andrews co-founded the Ukulele Club of Santa Cruz, CA and helped guide the club to hundreds of members and has been featured in two documentary films,”The Mighty Uke” and “Under the Boardwalk.” He teaches music workshops at ukulele festivals on the mainland and in Hawaii. In 2004 he produced the legendary “UkeFestWest” festival in Santa Cruz, and at that event he created the “Ukes for Kids” program that has given away hundreds of ukuleles to children and teachers. 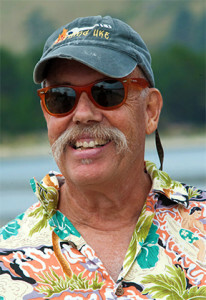 Andy now resides on Hawai’i Island, and teaches ukulele at Kua O Ka La Charter school. He also leads kanikapilas and workshops at Keoki Kahumoku’s Hawaiian Music Camps in Pahala. Since moving to Hawai’i he has started the “Puna ‘Ukulele & Kanikapila Association” (PUKA), conducts and teaches classes in ukulele, blues styles and music theory. Tunes’ veterans the Hood River Trio — Ben Bonham, Kerry Williams, Ronnie Ontiveros — are joined this year by Louisiana musician and performer Albanie Falleta. Let them whisk you away with their musical style which incorporates early country blues, early jazz, early Western swing, early Tin Pan Alley, late electronica, early hapa haole, early elevator and early punk rock. All brought to you with an undercurrent of irreverent humor! Bryan Holley is a musician, ukulele teacher, performer, and songwriter who loves to sing. Bryan lives in Ashland, Oregon where he specializes in teaching beginners of all ages. 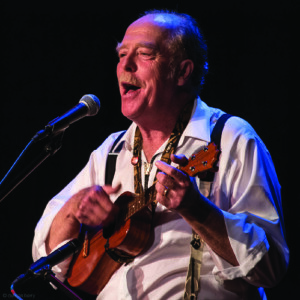 He has concentrated his lifelong passion for music into a series of ukulele workshops with useful handouts and song charts that help participants advance their musical journey. His workshops have explored Hawaiian and Latino music, the songs of Pete Seeger, the hits of 1915 (when the first ukulele craze swept America), and fingerstyle ukulele.